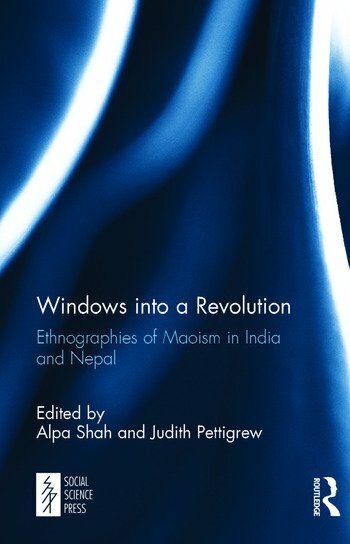 Windows into a Revolution edited by Alpa Shah and Judith Pettigrew, the first book in the series offers glimpses into the spread of Maoism in India and Nepal by tracing some of its effects on the lives of ordinary people living amidst the revolutions. Weaving through the nostalgic reflections of former Bengali Naxalites; the resurgence of ancestral conflicts in the spread of the Maoists in the remote hills of western Nepal; the disillusionments of dalits of central Bihar in the policies of the cadres; to the complexities of the interrelationship between non-aligned civilians and insurgents in central Nepal, the book offers a series of windows into different stages of mobilization and transformation into what are, were or may become, revolutionary strongholds. Alpa Shah is Senior Lecturer in Anthropology at Goldsmiths, University of London. Her research focuses on social inequality and efforts to address it and she has commented on indigeneity, environmentalism, migration, development, corruption, democracy, citizenship and the state. She is co-editor (with Tobias Kelly) of A Double Edged Sword: Protection and State Violence (2006) and author of In the Shadows of the State: Indigenous Politics, Environmentalism and Insurgency, Jharkhand (2010). Judith Pettigrew is Senior Lecturer in the Faculty of Education and Health Sciences at the University of Limerick, Ireland. She has conducted long-term anthropological research in Nepal since 1990 and has published widely on Nepal’s Maoist movement. Her research on the everyday impacts of violence on rural people examines the interrelationships between space, emotional life, violence and psychosocial wellbeing. Her forthcoming monograph is titled, Ethnography and Everyday Life in Nepal’s Civil War.